Writing a cohesive and comprehensive review of a book that is neither is actually quite difficult! Every topic is was exactly half a page. On the top is a picture of the iPhone or other item and the bottom has a paragraph or two of verbage. Flipping the "silent mode" switch is given about the same attention as troubleshooting the connection to a wireless network? Huh? 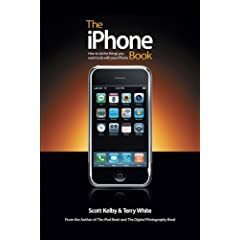 The saving grace of their book is the admission that they stole some tips from David Pogue in spite of the fact that he writes for a competitor to Peachpit. Why accept a substitute when the Pogue's book is a few clicks or steps away. You could drive a semi through the gaps in coverage. Complex topics are left to the reader to figure out for themselves and Windows users are completely left in the dust: there are no screen shots or tips for Windows users. Discrimination! The book had both a poor table of contents, but at least a decent index. While I was able to find the topics a majority of people care about, the coverage was so weak in some areas that I would classify it as one step above useless. Does an entire page need to be devoted to clicking the Safari button to open the browser and only a page to setting up your email?